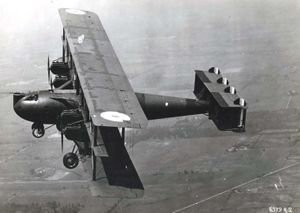 The Wittemann-Lewis NBL-1 "Barling Bomber" was an experimental long-range, heavy bomber built for the United States Army Air Service in the early 1920s. 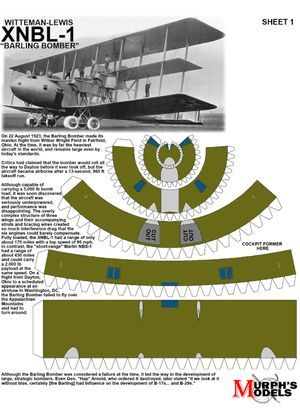 Although unsuccessful as a bomber, it was an early attempt at creating a strategic bomber. On 22 August 1923, the Barling Bomber made its maiden flight from Wilbur Wright Field in Fairfield, Ohio. At the time, it was by far the heaviest aircraft in the world, and remains large even by today's standards. On its first flight, it was piloted by Lt. Harold R. Harris, and Lt. Muir S. Fairchild, future U.S. Air Force Vice Chief of Staff. The flight engineer was Douglas Culver. Barling flew along as a passenger. Critics had claimed that the bomber would roll all the way to Dayton before it ever took off, but the aircraft became airborne after a 13-second, 960 ft (290 m) takeoff run. The flight lasted 28 minutes and reached an altitude of 2,000 ft. Although capable of carrying a 5,000 lb (2,300 kg) bomb load, it was soon discovered that the aircraft was seriously underpowered, and performance was disappointing. 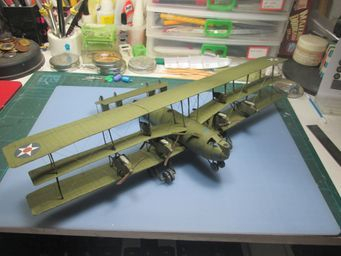 The overly complex structure of three wings and their accompanying struts and bracing wires created so much interference drag that the six engines could barely compensate. Fully loaded, the XNBL-1 had a range of only about 170 miles (270 km) with a top speed of 96 mph (155 km/h). In contrast, the "short-range" Martin NBS-1 had a range of about 450 miles (725 km) and could carry a 2,000 lb (900 kg) payload at the same speed. On a flight from Dayton, Ohio to a scheduled appearance at an airshow in Washington, DC, the Barling Bomber failed to fly over the Appalachian Mountains and had to turn around. Although the XNBL-1 was not put into production, it had advanced features such as aluminum fuselage components, adjustable multi-wheel undercarriage, separate compartments for crew, a flight engineer, electrical instruments and advanced engine controls. One unusual feature was that the incidence of the tailplane could be adjusted in flight using a lever in the cockpit. The XNBL-1 was the largest aircraft built in the United States until the Boeing XB-15 in 1935.